이 교서는 선조 37년(1604) 임진왜란 때 경상우도수군절도사로서 왜군과 대적하여 크게 이기고, 정유재란 때 통제사가 되어 적선을 물리치다 장렬하게 전사한 원균(1540∼1597)에게 공신으로 임명한다는 내용을 담은 공신교서이다. 이것의 내용은 왜군을 물리치고 장렬하게 전사한 원균에게 죽은 후에도 그 후손들을 계속해서 보살필 것임을 밝히고, 노비 13명, 전 150결, 은 10냥, 옷감 1단, 말 1필을 내린다는 것이다. 이 교서와 함께 있는 치제문은 선조 38년(1605) 정월 18일 임금이 의정부좌찬성으로 증직된 원균의 영전에 그의 죽음을 기리어 제사를 지내게 한 글을 담은 문서이다. 이 교서는 임진왜란 당시 왜군을 물리치는데 많은 공을 세운 원균 장군에 대한 새로운 평가를 할 수 있는 좋은 자료로 평가된다. 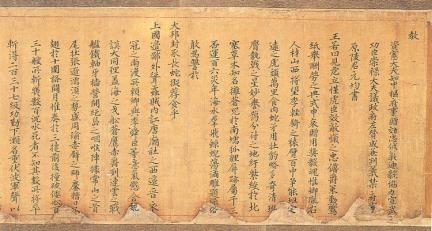 This royal certificate was issued by King Seonjo of the Joseon Dynasty to Won Gyun (1540-1597) in 1604 (37th year of his reign). Won Gyun was bestowed the title meritorious subject in recognition of his outstanding achievements in defeating the Japanese troops during the Japanese invasion in the late 16th century. As a navy commander, Won Gyun was killed in action. According to the certificate, the king promised to take care of Admiral Won’s descendants and conferred prizes including slaves, land, silver, cloth, and horse. 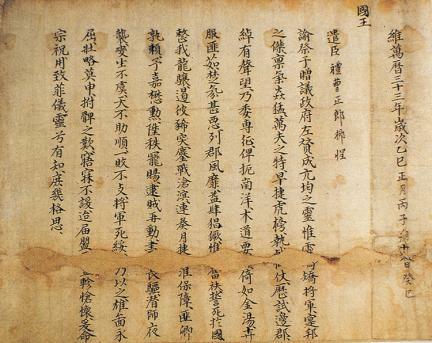 This is regarded as a valuable historic evidence in evaluating Won Gyun’s accomplishments in the war against the Japanese invaders.